A modest proposal to moderate Trump’s tweets. A modest proposal to prevent an accidental nuclear war. When President Donald Trump made a surprise and controversial announcement about banning transgender people from serving in the military, he didn’t hold a press conference or issue a statement. He tweeted three times in his typical unthreaded and disorienting Twitter style, over a period of 13 minutes. Now, the ban on transgender people is clearly something that needs to be discussed, and thankfully, that’s happening. But we also need to talk about Twitter moderation and the need to prevent the world from stumbling into nuclear annihilation. In announcing the ban, the president freaked a bunch of people out, including top brass at the Pentagon, according to BuzzFeed. No big deal. Just people at the headquarters of the Department of Defense wondering whether we were attacking North Korea. The president’s recent actions on Twitter should be a wake-up call for Twitter and its CEO, Jack Dorsey. What if the president is tweeting with mittens on and has a fat finger moment that threatens national security? Thankfully Trump typos like “covfefe” aren’t lethal themselves or we’d all be dead, but this doesn’t mean that a typo can’t do a lot of harm. What if Trump tweeted, “After consulting with my generals I am announcing that I have escalated military action with Syria” instead of “After consulting with my generals I am announcing that I have de-escalated military action with Syria”? Two letters can make a big difference. Or what if he loses his temper and says something that is perceived as a military threat, even if he just intends it as empty bombast? Or what if someone hacked his account and tweeted that we were about to, say, bomb an ally? We already know that Trump’s tweets can move financial markets. Do we really want to find out if they can scramble fighter jets? Many people have called for Twitter to ban Trump for violating community standards against hate speech and harassment—there’s even an online petition with thousands of signatures. Rep. Keith Ellison, D-Minnesota, stated that the president should be banned because he’s a “social media bully.”* In the aftermath of the election, when this conversation first began, Twitter said that banning Trump was possible, stating, “The Twitter Rules apply to all accounts, including verified accounts.” But the company hasn’t banned him, and I doubt it ever will. 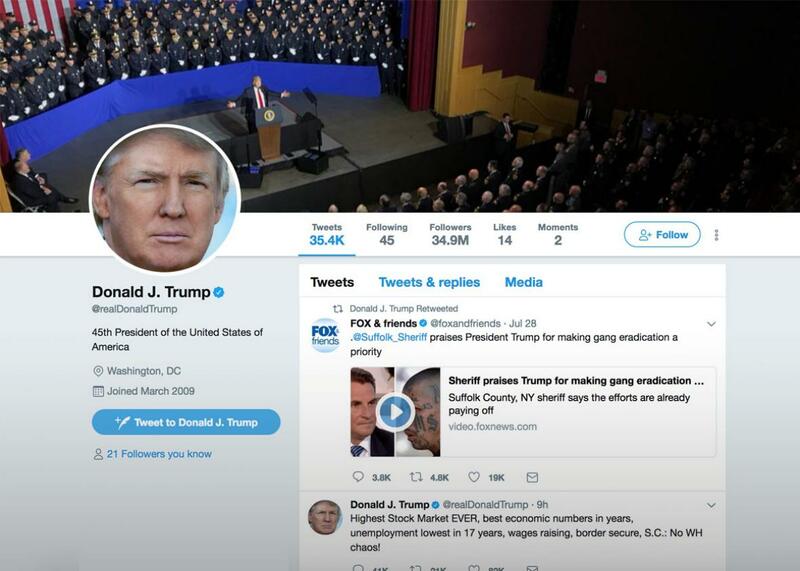 Twitter would struggle to maintain its relevance—after all, the president is a major draw—and the company would likely be subject to enormous pressure to reverse its decision. But as worrisome as they are, hate speech and harassment aren’t the most pressing concerns here—security is. Because a typo or anger could lead to a major international incident, we need a safeguard. Luckily, there’s a solution. Premoderating the actual content is the only way to ensure that unauthorized (or particularly dangerous) tweets from the president are not published. Implementing such a system would be an uphill, deeply contentious battle. But it would be in everyone’s best interest. If nothing is clearly dangerous, the tweet would go live as normal. But if there were a major issue—like a threat of military action, or something suggesting that the account had been compromised—then the Twitter representative would make sure that the tweet doesn’t go live. Twitter would need a detailed social media triage and crisis communications plan, one that outlined how things should be escalated and managed. So for example, let’s say the president tweeted something like “someone should take out North Korea … you have my blessing.” The sharp-eyed Twitter moderator would notice the tweet, hold it for release, and call a predetermined contact at the administration to sort through the issue. While it would have to apply to only a small group to be workable, it could go beyond Trump to include a few other accounts with outsize global influence. If Kim Jong-un ever decided to join Twitter, I would surely hope that his tweets would be premoderated. Dorsey may think that he’s doing the right thing by confirming recently that President Trump has to follow the same Twitter rules as everyone else. But merely treating the president the same as general users is irresponsible. (Twitter has already signaled that some accounts are more important than others and are treated differently—they’re called verified accounts.) Without premoderation, Twitter can be used as a weapon, either intentionally (like Trump threatening an attack, or a hacker group compromising his attack) or unintentionally (via typos). It’s time for Twitter to recognize its ethical responsibility. It has to premoderate the president’s tweets and remove or hold any that could have major implications for this country and mankind. The best historical analogue might be President Richard Nixon’s secretary of defense trying to ensure that a drunk president couldn’t order a nuclear strike on his own. Except in this case, Dorsey wouldn’t be undermining the president’s authority—he owns the company and calls the shots. Moderating the president would be a power that, I hope, Twitter would never have to exercise—but the company needs a plan for how to manage tweets that threaten national security. If you’re concerned about muzzling Trump, don’t forget: This wouldn’t be a First Amendment issue. As a company, Twitter determines its own rules and terms of service. Furthermore, the administration has a myriad of ways to communicate with the public. It could release an official press release with all the information at once instead of trickling it out over time in 140-character bursts. It could make a statement via the press secretary where she could respond to important questions in a timely fashion. Trump could also give a televised address from the Oval Office. I’m not sure that the president remembers that there are options other than tweeting, but it would be good to remind him.